WTTW, Chicago's premier public television station, will broadcast Kartemquin's 2015 In the Game at 9PM on Thursday October 6, as part of a year-long series honoring our 50th Anniversary. Encore broadcasts will also happen on Friday October 7, at 3PM, and again at 3AM on Tuesday October 11. The film will also be streaming online during these dates and times for America Reframed. 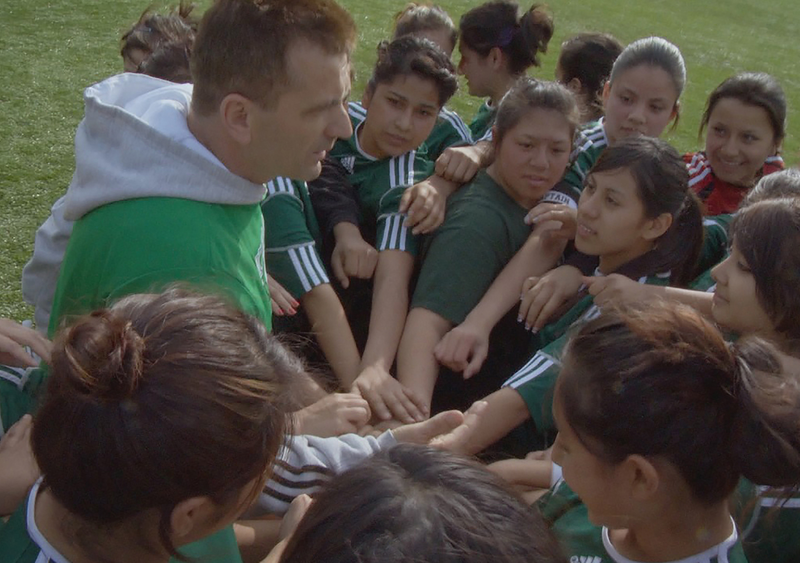 The film follows the ups and downs of a girls' soccer team to reveal the very real obstacles that low-income students confront in their quest for higher education. Set in a primarily Hispanic neighborhood, Kelly High School on Chicago's south side is an inner city public school struggling to provide the basics for their students, many of whom do not make it to college, either because they cannot compete academically or because their families do not have the financial resources to send them to college. Described as "an intimate study in sisterhood and hope in the face of adversity" by Barbara Scharres at the Gene Siskel Film Center, the film has continued to create impact in the lives of its subjects. At the Chicago Latino Film Festival in April of 2016, Finitzo and the three subjects featured in the film--Elizabeth, Maria and Alicia--announced that all three young women had returned to college after receiving scholarships from The Reva and David Logan Foundation. Coming up next in the WTTW monthly broadcast series is Vietnam, Long Time Coming, airing in November. Other highlights of Kartemquin’s 50th anniversary year include several retrospectives and screenings in Chicago and nationwide; an art exhibit; a book; workshops, panels, and master classes; and online streaming of the organization’s entire catalog of award-winning documentaries via http://watch.kartemquin.com. The full calendar, which will be updated throughout the year as new events and partners are added, is available at www.KTQ50.org. Join the conversation on Twitter at @Kartemquin or by using #KTQ50.